Did you know Old McDonald was a really bad speller? On my lazy Saturday I finally got up and turned on the Olympics. I know, I missed Team USA playing hockey and I can live with that. But I get to catch more skeleton so I’m ok. I just saw this Geico commercial…. In this Geico Insurance ad, the guy asks his colleague “Did you know that Old McDonald was a really bad speller?” So what did you think? I’ll put a quick poll for some options, feel free to add your answer if I didn’t think of it! My first reaction? It was to see that farmer as Mike Haley (aka @FarmerHaley)! Seriously! That was my first reaction. And there’s a meme to go with it now! 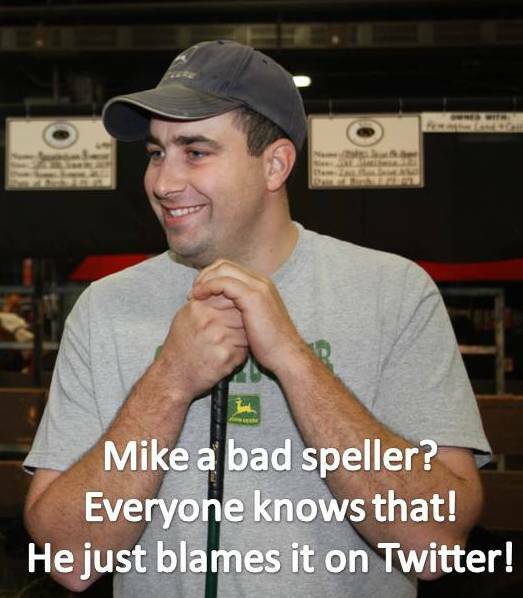 Mike is a really bad speller. And seeing him at a spelling bee, well that made me really laugh and I could hear him laughing too! The commercial was definitely funny for me! 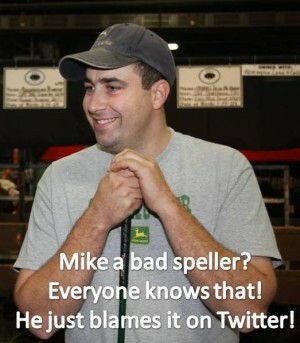 Then I thought of other farmer friends who are good spellers…. surely people would see this was a goofy ad. Nobody would assume farmers can’t spell … but since he had it right and couldn’t stop at cow, maybe people would think farmers just don’t know when to quit. Well, that’s a good possibility knowing some of the farmers I know! Some of my farmer friends really don’t know when to quit at times. I see them posting about harvest or calving checks all hours of the night. They work long days just like many of the rest of us do. Some doctors and nurses have on-call times that leave me stunned. Lots of CPAs are beginning to work longer days & weeks for tax season. Heck, even my beloved travel can get too long. Anyway, it was just a fun series of thoughts while I watched the Olympics. Hope everyone is having a great weekend and letting your mind wander and taking time to laugh! It is cute like most of Geico’s commercials. But does it make me switch to their insurance, no. There has never been any factual evidence that I have seen indicating whether Old McDonald was a good or bad speller. Old McDonald may have, in fact, heard the song about him and therefore learned to spell the words wrong. But there is nothing I have ever seen that supports that conclusion. So slightly funny commercial, but not going to make me switch. I would hate for Flo to use that big antigravity atom splitting board on me. It is kind of a funny ad. It’s good to see something that makes you smile, even if it’s a little silly. Thanks Deanie! Hope you are having a good weekend as well! Fortunately, you can count on farmers not quitting after they put in their 30 hours, except maybe a few backyard chicken raisers in San Francisco. As Paul Harvey said in 1978, “during planting time and harvest season, [a farmer] will finish his forty-hour week by Tuesday noon, then painin’ from ‘tractor back,’ put in another seventy-two hours. So God made a farmer.” Farmers are going to keep at it until the work is done, regardless. I take offence to this!